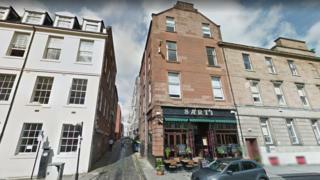 A man is seriously ill after he was struck by a car as it was reversed out of a garage in Glasgow city centre. The incident involved a BMW and happened in Bath Lane at about 16:30 on Friday. The 36-year-old was taken to Glasgow Royal Infirmary where staff described his condition as serious. Police Scotland said the 51-year-old BMW driver was not injured. Officers are keen to speak to any potential witnesses. Sgt Kenny Malaney said: "From our inquiries we know that a man in a white van stopped to assist after the incident, however, unfortunately he left prior to police arriving. "We would be keen to speak to him as he may have some information that could assist our inquiries."